It is on the strength of arguments such as these that the supporters of the minister have labeled Babalakin the instigator-in-chief of Oduah’s clearly self-inflicted woes. 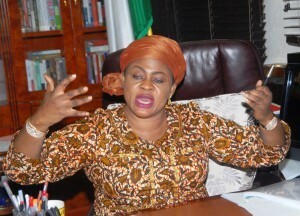 There have been some allusions, both from official and unofficial quarters, to the fact that some influential individuals with stakes in the aviation sector, led by the Chairman of Bi-Courtney Group, Dr. Wale Babalakin, engineered the present travails of the Minister of Aviation, Ms. Stella Oduah, simply because her so-called transformation agenda conflicted with their business interests. Some even went as far as suggesting that the basic rationale for purchasing two armoured vehicles, worth N255 million, for the minister was the apparent threat to her life by these “powerful” individuals, while some others concluded that Babalakin, being “a victim of the ongoing aviation reforms”, would be a willing financier of the campaign for the removal of the minister. A particular commentator, Ore Kingsley, actually claimed in an article in THIS DAY of October 23, that Babalakin and Bi-Courtney have the highest motivation for seeking a sudden end to Oduah’s tenure, and possibly her life, because they stand to gain the most from such an eventuality. Truth is that the judiciary, up to the Court of Appeal, has affirmed Bi-Courtney’s ownership of GAT and the 36 years tenure of the concession. As a matter of fact, the arbitration panel, which first heard the dispute between Bi-Courtney and FAAN, did not only order the immediate hand over of GAT to the company but also awarded N132 billion damage against the government. Since then, there have been several appeals by different entities, including the two mainstream trade unions in the aviation sector, Ojemai Holdings, which claims to be the landlord of Arik Air, FAAN itself and the Attorney General of the Federation on behalf of the Federal Government/Aviation Ministry, all of which were dismissed by the courts. In fact, a particular judgment by Justice G.K. Olotu of Federal High Court, Abuja Division, delivered on July 3, 2012, in a case between Bi-Courtney and the Attorney General of the Federation, put the position of the law on the issues between Bi-Courtney and the Aviation Ministry beyond any shade of doubt. The judge, in his ruling, noted: “In the case before the court, we have seen the gross, deliberate, calculated and heinous abuse of the rule of law, typified by the acts of the Federal Government of Nigeria, headed by the President, assisted by the Minister charged with responsibilities for aviation matters in disobeying the judgment of the court delivered on 3rd March, 2009, i.e. approximately three years and three months ago, to deliver the immediate possession of the GAT to the plaintiffs (Bi-Courtney) as ordered by the court. Let us even for a moment pretend that Babalakin and his company are involved in a plot to unseat Oduah, as being alleged. How does that excuse the countless air mishaps that have dogged the minister’s tenure, the cosmetic transformation of the aviation sector through the remodeling of some terminals, the arrogant and terrifying manner she reacted to the crash of the Associated Airline plane that claimed 14 lives by saying it was “inevitable” and an “act of God”, and the most recent scandal involving the secret purchase of two armoured BMW cars? For the records, this is a man who held sway as the Chairman of the Committee of Pro-Chancellors as well as the Chairman of the Implementation Monitoring Committee of the 2009 Agreement between the Federal Government and university-based unions, the same agreement at the heart of the current ASUU strike, and in all those years ensured there was not a single strike by any of the unions, save for a short-lived strike by ASUU in solidarity with state universities in the South-East. It was for these reasons that President Goodluck Jonathan referred to him as “the man who has been helping us to stabilise the universities”, and also why the immediate past President of ASUU, Prof Ukachukwu Awuzie, applauded him for the “unprecedented understanding and passion he has shown for the University cause for which he is now nicknamed ‘Chairman of ASUU’”. How long will it take before we start seeing injustice to one of us and injustice to all of us? It is this complacent attitude that has fueled the arrogance that is common among our leaders and the disdain with which they regard us whenever we chance to raise our voice in protest. This attitude of ours also brings to memory the words of Martin Niemoller, a priest, during the Nazi tyranny in Germany. It was ‘big man’ Babalakin yesterday, when the ministry of aviation and Federal Airports Authority (FAAN) wantonly violated an agreement they validly entered into with his company, with the attendant consequence of disrupting his projections and driving him into huge and avoidable debts. Also, we could not be bothered when FAAN officials stormed the site of a four star hotel and conference center, being developed by Bi-Courtney at the airport, and vandalized the company’s property and also assaulted its staff, in a clear and malicious violation of a subsisting court order restraining it from such action. Were we not also witnesses to numerous reports of how the aviation ministry, for selfish reasons, has frustrated and sometimes resisted efforts by Bi-Courtney to upgrade facilities at the airport to enhance safety, yet, did not raise a finger in protest? The chicken has probably not come home to roost yet. Forget the fact that we are all now aware of how precarious our airspace is or how inept and greedy officials running the aviation sector are. We may not have seen the worst of disasters in the aviation sector if we do not now insist on government doing the right things and doing things right. – Remi Ladigbolu is of the Communications Department of Bi-Courtney Group.